Our web app is running in .Net Framework 4.0. The UI calls controller methods through ajax calls. We need to consume REST service from our vendor. I am evaluating the best way to call REST service in .Net 4.0. The REST service requires Basic Authentication Scheme and it can return data in both XML and JSON. There is no requirement for uploading/downloading huge data and I don't see anything in future. I took a look at few open source code projects for REST consumption and didn't find any value in those to justify additional dependency in the project. Started to evaluate WebClient and HttpClient. I downloaded HttpClient for .Net 4.0 from NuGet. I searched for differences between WebClient and HttpClient and this site mentioned that single HttpClient can handle concurrent calls and it can reuse resolved DNS, cookie config and authentication. I am yet to see practical values that we may gain due to the differences. The REST calls return in 3-4s which is acceptable. Calls to REST service are initiated in controller methods which gets invoked from ajax calls. To begin with, the calls run in a different thread and doesn't block UI. So, can I just stick with sync calls? The above code was run in my localbox. In prod setup, DNS and proxy lookup will be involved. Is there any advantage of using HttpClient over WebClient? Is HttpClient concurrency better than WebClient ? From the test results, I see WebClient sync calls perform better. Will HttpClient be a better design choice if we upgrade to .Net 4.5? Performance is the key design factor. I live in both the F# and Web API worlds. There's a lot of good stuff happening with Web API, especially in the form of message handlers for security, etc. I know mine is only one opinion, but I would only recommend use of HttpClient for any future work. Perhaps there's some way to leverage some of the other pieces coming out of System.Net.Http without using that assembly directly, but I cannot imagine how that would work at this time. Http­Client is more closer to HTTP than Web­Client. Http­Client was not meant to be a com­plete replace­ment of Web Client, since there are things like report progress, cus­tom URI scheme and mak­ing FTP calls that Web­Client pro­vides — but Http­Client doesn’t. If you’re using .NET 4.5, please do use the async good­ness with Http­Client that Microsoft pro­vides to the devel­op­ers. Http­Client is very sym­met­ri­cal to the server side brethren of the HTTP those are HttpRe­quest and HttpResponse. Con­trol over caching and shared cache. Inject your code mod­ule into the ASP.NET pipeline. Cleaner and mod­u­lar code. also has the xcopyable/portable-framework version of the library if you want to use it on other platforms - .Net 4.0, Windows Phone etc. If you are writing a web service which is making REST calls to other web services, you should want to be using an async programming model for all your REST calls, so that you don't hit thread starvation. You probably also want to use the newest C# compiler which has async/await support. Note: It isn't more performant AFAIK. It's probably somewhat similarly performant if you create a fair test. Firstly, I am not an authority on WebClient vs. HttpClient, specifically. Secondly, from your comments above, it seems to suggest that WebClient is Sync ONLY whereas HttpClient is both. I did a quick performance test to find how WebClient (Sync calls), HttpClient (Sync and Async) perform. and here are the results. Not the answer you're looking for? Browse other questions tagged c# .net rest webclient dotnet-httpclient or ask your own question. 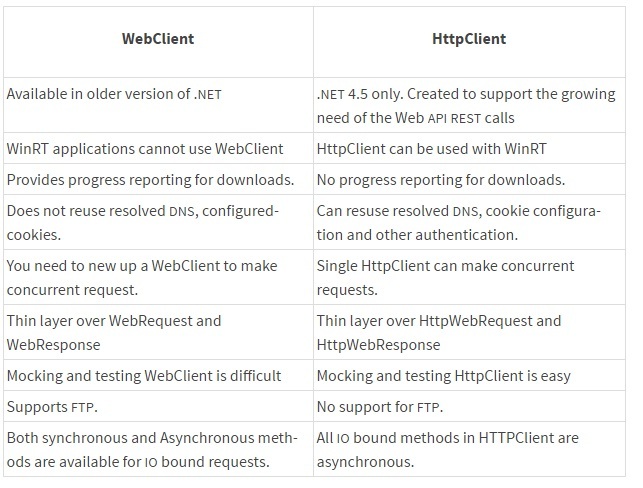 What is the overhead of creating a new HttpClient per call in a WebAPI client? What difference is there between WebClient and HTTPWebRequest classes in .NET? Download file with WebClient or HttpClient? How to Replace WebClient with HttpClient? Why is HttpClient BaseAddress not working?